One is that politics is not a clubhouse. Politics is messy. It is meeting everyday people where they are. It’s not an enclave. It’s not being the enlightened, ‘super‑woke’ people together, learning a special vocabulary, shaking our heads and wagging our finger at all these backward other people. That is a manifestation of the same social elitism that is actively structured by neoliberal society. Instead, politics needs to be woven into the fabric of all of our lives. The other intervention is that we need power… if we are involved in politics, that is what we are signing up for. We are signing up for building, holding and wielding political power, and wrestling with all of the questions and quandaries that come with that. Broadly speaking, the project of the left is expanding who has political power. It’s saying political power should not be concentrated in the hands of the few, the wealthy, or an elite technocratic class. Jonathan also discusses the “ninth chapter” of Hegemony How-To, which didn’t make it into the final edit of the book. Read the full interview at Red Pepper. The central tension [Smucker] struggles with is that people become radical activists out of a desire to change the world, but often find the subculture of radicalism to be an attractive refuge from the unjust world. This undermines their capacity to connect with people outside their small subculture — but it is only by aligning themselves with substantial portions those outside people that they can actually hope to change the world. Anarchistic emphasis on building “prefigurative” relations in the here and now developed out of a pessimism about the liberatory potential of attaining state power. The first few years in this period of renewed interest in the state-oriented approach haven’t exactly proven them wrong. Read the full review at The Indydependent. 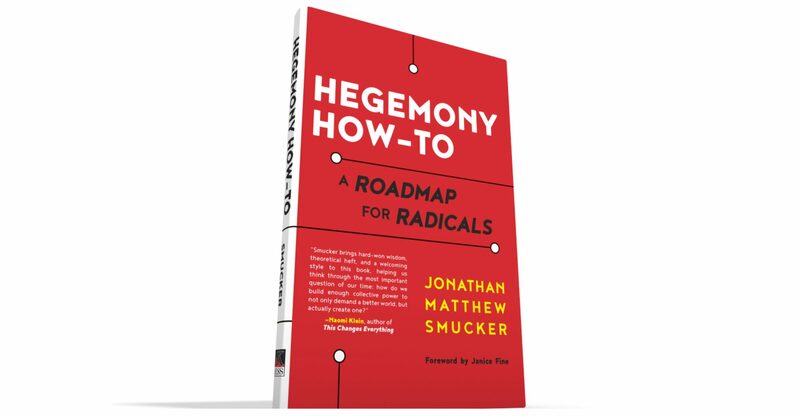 In his recent talk at the Personal Democracy Forum, Jonathan Smucker expanded upon a key theme in chapter one of Hegemony How-To: why and how to avoid the “activist” label. He goes on to discuss how Lancaster Stands Up has been integrating this approach into its organizing practice since the November 2016 election – with remarkable results. Rebecca Tarlau writes a reflective review of Hegemony How-To for the Berkeley Journal of Sociology, discussing the book’s concepts through the lens of the organizing work of Brazil’s Landless Workers Movement (MST). …prefigurative and strategic politics can feed off of one another. Every institutional space that the movement occupies and constructs—from autonomous movement schools, to public universities, to agricultural cooperatives—becomes a space for the prefiguration of the movement’s political and economic goals. Tarlau agree’s with Smucker’s goal of the left abandoning its purism in order to develop broad-based political power, but she reflects that “building this type of broad-based political alliance can produce a serious tension: how to grow a movement, without losing the ideals that began its struggle” – again lifting up the case of the MST as a challenging example of this tension. Read the full review at the Berkeley Journal of Sociology. Bruce E. Levine wrote a thoughtful review of Hegemony How-To for Counterpunch. Smucker spares nothing and no one—including himself—in his passion to achieve political victory. Read the full review at Counterpunch.